Acoustic Americana covering folk, blues and country. Stylistically his music circles around the area where folk meets Americana meets country, drifting more into one realm that the other as the songs demand. Most of the songs are simply delivered via voice and guitar, occasionally embellished by the subtle use of other instruments, such as fiddle. Barber, is a narrative songwriter, one that is more than capable of writing both emotional songs and songs with wry humour, but to me he's at his best when he's focusing on some of the more mundane things in life, songs about getting by in a big old world and it's his ability to carry off that sort of material that sets him apart from a number of his peers. Over the course of the album he brushes up against some of the more familiar themes, such as bad things happening to good people and the reverse aspects of how the devils seems to look after his own, but he also reflects on the smaller things that help make life look good no matter where you sit in the social spectrum and that hope can sometimes deliver upon the expectation made of it. His fluidity across the genres gives him plenty of scope to alter both tempo and melody, keep the whole album fresh from start to finish. Similarly he's done a great job in getting the album to flow as a whole. 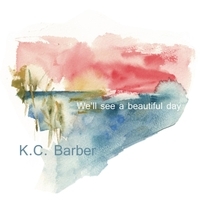 "We'll See A Beautiful Day" is a good songbook and K C Barber a well worthy writer.